Avocado Shrimp Salad tossed with fresh veggies and a tasty cilantro lime dressing with quick marinated onion. Helloooooo Summer! While I love me some leafy greens, I’m also really big on lettuce-less salads. They’re part salad, part side dish, and entirely awesome! Some of my favorites include greek green bean salad, healthy chickpea salad, and cherry tomato salad. They’re crazy quick, easy, and crazy refreshing on a hot Summer day! Or hot Spring day if you’re here in Florida. It’s only May and I’m having to crank the AC in my car to full blast before I can even get in it. I’d start fantasizing about Fall temperatures but then I’d be missing out on all this amazing warm weather produce! Instead I’ll be anywhere there’s AC or lots of shade, stuffing my face with this avocado shrimp salad, living it up. So I’m still relatively new to chilled shrimp salads, as in I’ve only been making them for the past year or so. I don’t know what took me so long! There’s a local seafood restaurant here that has a ceviche-like shrimp and crab veggie salad on their menu that is served with tortilla strips in a martini glass. It’s phenomenal and totally the inspiration behind this delish dish! 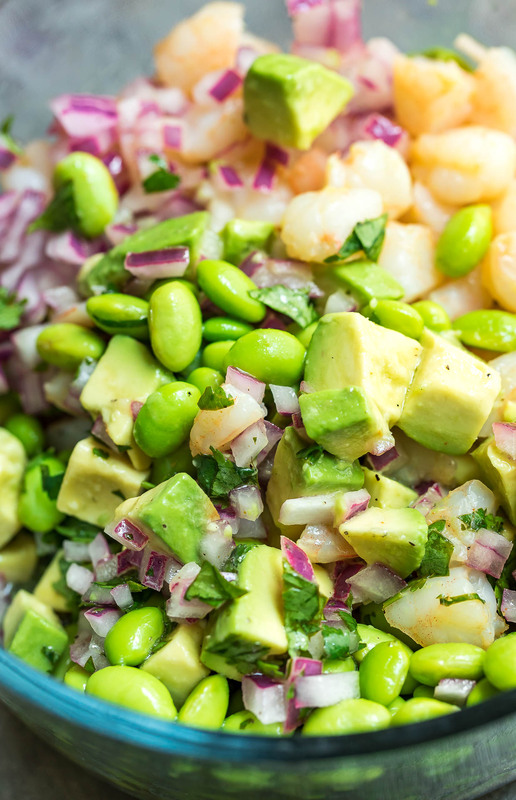 This amazing avocado shrimp salad is great for backyard barbecues, picnics, al fresco dinners with the fam, and all your Summer shenanigans. 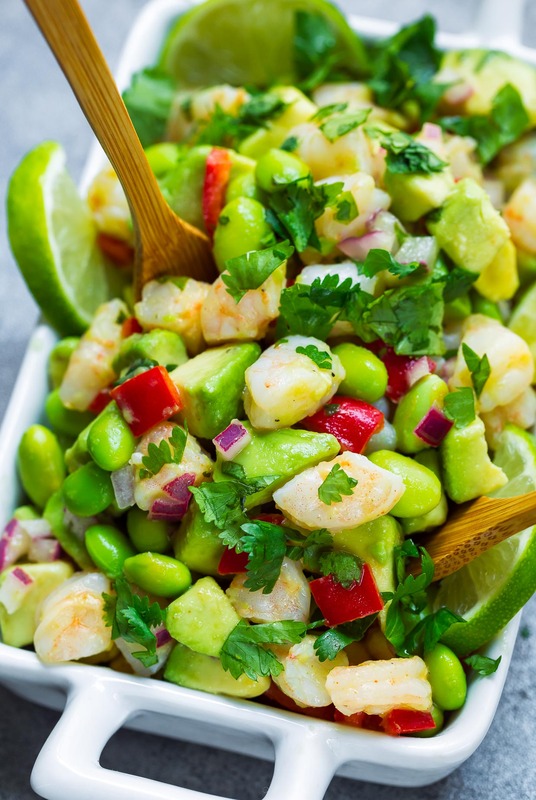 It features a medley of fresh chilled shrimp, red onion, avocado, edamame, and a little red bell pepper for a burst of color. You can also use tomatoes in place of the pepper (it’s great both ways) or add them both! I’ve also added corn to this salad and loved it like woah. Have fun with it – this salad is crazy versatile and perfect for all the hot Summer days ahead! 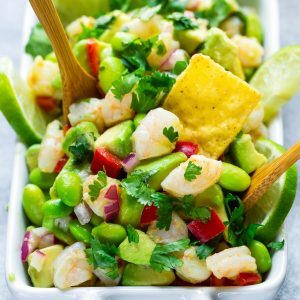 Serve this avocado shrimp salad with tortilla chips as a fresh and tasty salsa for snacking or as a side dish for your favorite warm weather entrees. I’m a big fan of serving this with grilled salmon or veggie burgers. It would also be BALLER with my seared salmon tacos <– I’m totally trying this combo out next week for dinner! 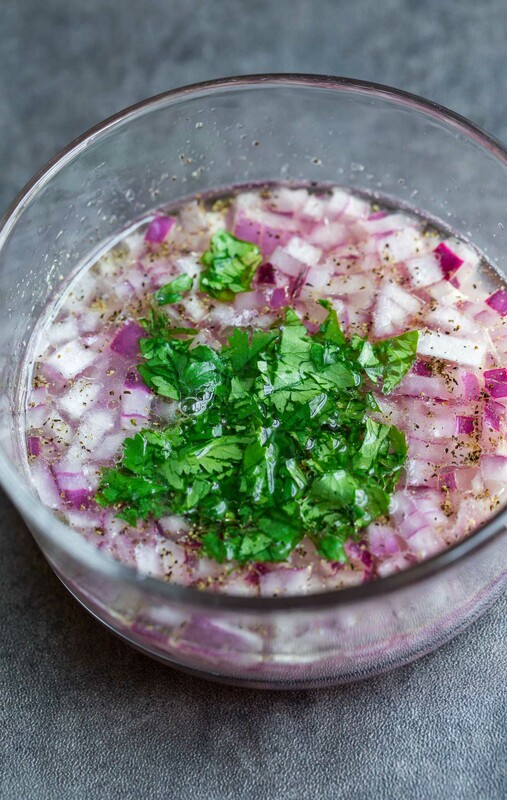 Combine chopped red onion with avocado oil, juice of 2 and a half limes, fresh cilantro, salt, and pepper. Marinate for 10-15 minutes while you prep the rest of the salad. I decided to marinate the onions in the dressing because marinated onion makes everything more magical! It also cuts the "bite" of the raw onion, allowing the flavors to really shine through! You have a few choices with the shrimp here. You can cook it from fresh or frozen, use fresh pre-cooked shrimp (often labeled shrimp cocktail shrimp) from your grocer's seafood counter. I like to thaw frozen shrimp, season with salt and paprika, and quickly sauté/steam them with a little bit of oil and water. After I chop them into bite sized pieces and pop them in a bowl in the fridge to chill while I make the rest of the salad. Peel and cube your avocados and combine with steamed edamame and chopped bell pepper in a medium-large bowl. Pour your marinated onion dressing over the veggies and add your chilled shrimp. Toss gently to coat and add any additional seasoning you'd like! More salt and pepper are welcome if you prefer it and extra chopped cilantro makes a pretty garnish. Dig in right away! We've left this chilled for an hour or two in the fridge to it get even colder and while it's pretties fresh, it's still crazy tasty this way! The avocado will start to brown eventually so this salad is best enjoyed the day of. See post for tasty servings suggestions and more! If you get a chance to try this tasty avocado shrimp salad, let me know! Leave some love in the comment form below or tag your photos with @peasandcrayons on Instagram so I can happy dance over your creation. 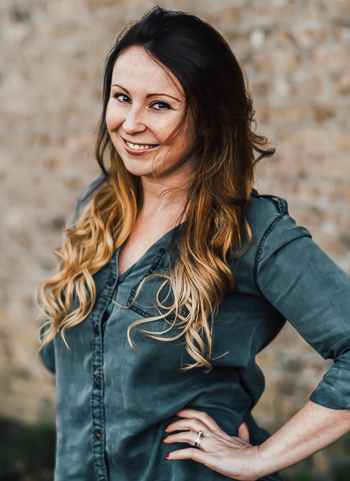 I am changing my life and the way I eat. I want to live longer and I am determined to feel better. Your recipes are just what I was looking for and need. Thank you so much Dawn! Hope you love the recipe and make some *amazing* veggie-filled recipes that make you feel wonderful! This salad has to be the best salad I have ever had. Super easy and fresh for summer. Thank you. Giiiirl, this salad looks amazing! 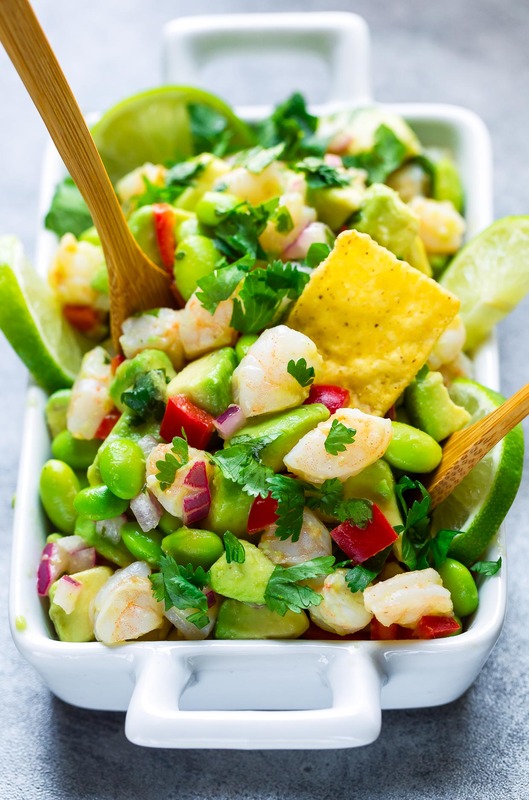 I’m all about the shrimp and avocado combo, and I’m thinking this is perfect for sharing over Memorial Day Weekend. Bravo!